The Oregon MBA combines a solid foundation of core business courses with numerous electives and a myriad of experiential learning opportunities focused on our four signature centers in Entrepreneurship, Securities Analysis, Sports Business, and Sustainable Business Practices. Eight core courses, a capstone class, and an emphasis on effective presentations, business writing, interviewing skills, team dynamics, and case analysis form the broad foundation for the electives and learning activities of our four centers. Built into our program are the annual China study tour and opportunities for summer study abroad. The Oregon MBA combines a solid foundation of core business courses with numerous electives and a myriad of experiential learning opportunities focused on our four signature centers in Entrepreneurship, Securities Analysis, Sports Business, and Sustainable Business Practices. Eight core courses, a capstone class, and an emphasis on effective presentations, business writing, interviewing skills, team dynamics, and case analysis form the broad foundation for the electives and learning activities of our four centers. Built into our program are the annual China study tour and opportunities for summer study abroad. All applicants to the Lundquist College of Business should first consider that all graduate business students are in full-time programs, and no part-time option is offered. Applicants are required to submit their GMAT scores (590 minimum), official undergrad transcript (minimum GPA of 3.1), essay/personal statement, at least two letters of referenc...All applicants to the Lundquist College of Business should first consider that all graduate business students are in full-time programs, and no part-time option is offered. Applicants are required to submit their GMAT scores (590 minimum), official undergrad transcript (minimum GPA of 3.1), essay/personal statement, at least two letters of reference, and a resume or summary of professional experience. Even though the students in this program are on the younger side, applicants with real-world business experience will be given particular attention. International applicants must submit TOEFL scores, with 600 minimum on the written test or 96 minimum on web-based. Interviews, while not a requirement, may prove beneficial for applicants, particularly those with little work experience. The Lundquist College of Business boasts four different centers, dedicated to sports mar­keting, security analysis, entrepreneurship, and business sustainability. Each of these centers aims to foster experiential learning to “provide [students with] opportunities to interface with the business community.” Regarding the college’s career services center, some students have told us that, while the “center is always willing to proofread a resume or cover letter,” many would like to see “increased on-campus recruiting” from businesses, both local and national, and overall improvements in “career service offer¬ings.” The school does arrange for “periodic visits to regional business centers” in San Francisco, Portland, and Seattle, and there is regular shuttle service to career fairs in Portland for interested students. “MBA recruiting is essentially non-existent,” one adver¬tising and marketing student tells us. But with some 110 employers actively recruiting summer interns each year, a mean base salary of $61,140 for recently graduated MBAs, and nearly 70 percent of students having either received or accepted a job offer by grad¬uation, U of O students appear to be pretty self-sufficient. The Oregon MBA is a small rigorous program which combines cross-functional training in all the business disciplines with experiential learning and more focused study in nationally prominent areas, such as Entrepreneurship, Sports Business, Securities Analysis, and Sustainable Supply Chain Management. 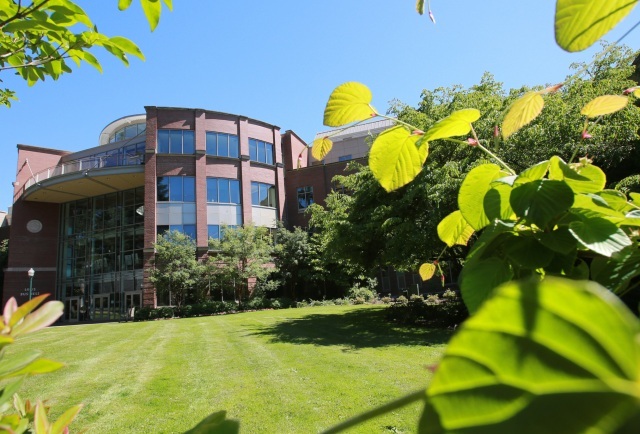 We’re proud to be an integral part of the Lundquist College of Business at the University of Oregon, the state’s flagship liberal arts institution and a member of the A.A.U., the prestigious association of 62 leading research universities in the United States and Canada. Educational excellence at LCB rests on four pillars: 1. The integration of liberal arts strengths—critical thinking, concise writing, research expertise, and the ability to see the world through the eyes of others—with the cross-functional study of business; 2. A faculty committed to advancing business knowledge through outstanding research and to propagating the understanding of business through exceptional teaching; 3. A learning environment that promotes experiential, team-based education through the most advanced physical and technological infrastructure; 4. Experiential learning in partnership with industry that affords students numerous opportunities to apply classroom learning and expand ethics, communication, teamwork, and leadership skills. What does that mean specifically for anyone interested in the Oregon M.B.A. program?1. Students with differing undergraduate and work backgrounds as well as Oregon values: concern for community and environment; belief in active, balanced life-styles; commitment to innovation and entrepreneurial initiative; 2. Classes that are small, diverse, collaborative, and close-knit; Instructors with impressive research and clinical credentials who take great personal interest in their students; 3. A rigorous first-year curriculum that combines cross-functional foundational knowledge with experiential learning through industry consulting; 4. Centers in entrepreneurship/innovation, leadership, sports business, securities analysis, and sustainable supply chain management that anchor the flexible second-year curriculum and serve as transmitters between disciplinary research and the interdisciplinary experience of the business community in Oregon and beyond. The University of Oregon’s Charles H. Lundquist College of Business is a relatively small, green-oriented school offering an “excellent program in sustainable business prac­tices,” a particularly “strong entrepreneurship tract,” and a top-ranked sports marketing and business program that, according to many students, is the “premier” program of its kind in the nation. As one very satisfied student puts it, “I would not have even looked at Oregon as an option if it weren’t for its renowned sports business program.” The Warsaw Sports Marketing program also offers its students the “opportunity to combine studies in corporate finance with the sports industry.” One student working toward an MBA in sustainable business praises the school’s “interdisciplinary nature” and its “abil­ity to work directly with companies to consult on real world issues.” However, based on the feedback we have received, the administration and faculty don’t do a lot of hand holding when it comes to the students. While students “benefit from personal attention from the teaching staff in terms of advice on courses, career paths, and general resources,” MBA candidates are expected to take full ownership of their studies and be proactive in their job search. The role sustainability plays in Oregon’s MBA program cannot be overstated. The College of Business’s MBA in sustainable business was established in 2008, and its pop­ularity has only grown since then. Many students come to Oregon specifically to earn their MBA at the school’s relatively new Center for Sustainable Business Practices housed in the Lillis Business Complex, a LEED silver certified facility and one of the most environmentally friendly buildings of its kind in the country. “Business schools are a dime a dozen,” says one sports business student, “I knew I wanted a school that offered a top-flight entrepreneurship focus, and the University of Oregon was tops on my list, but, beyond that, there is substantial value in being surrounded by students who are also staunchly interested in entrepreneurship.” In addition to Oregon’s lauded programs in sports management, sustainability, and entrepreneurship, a number of dual-degree programs are also available, including a JD/MBA and MS/MBA with varying concentrations, as well as individual programs in finance, supply chain management, accounting, and media/entertainment. An Executive MBA program, which is located in Portland, is also offered. There are almost 200 students in the graduate business programs, with approximately 100 of them pursuing an MBA. The age range of students is mid 20s to early 30s, and many in the program tend to arrive with at least a couple years of work experience, with backgrounds ranging from large corporations to small non-profit firms. Most students feel this helps provide students with a “well-rounded view of issues” that isn’t disconnected from “real-world experi­ences.” During students’ second year of study, full-time MBA students also participate in a strategic planning project over the course of two terms. Through this experiential learn­ing program, small student groups work as consultants to major Northwest businesses, including Adidas, Amazon, Hewlett Packard, and Intel. The Oregon MBA Program is 1. Small and personal: The entering class size is maximally 60, and second-year electives average under 30 students. Students form close relationships with each other and their professors. 2. Collegial and diverse: Friendly cooperation takes the place of cut-throat competition, and a student body drawn from wide sections of the US and the world offers multicultural lessons in diversity and tolerance. 3. Experiential and entrepreneurial: Through consulting, business planning, and competitions students learn to apply classroom learning to the real world as well as identify and pursue new opportunities. 4. Comprehensive and intense: Because we see the MBA as a broadly generalist and managerial degree, the Oregon MBA Programs makes you stretch beyond your comfort zone. 5. Flexible and interdisciplinary: The cross-functional core curriculum of the first year provides the broad foundation on which students plan their own program of courses in one or several of 7 different focus areas. 6. Quintessentially Oregon: The program and its students are the embodiment of Oregon values--concern for community and environment; belief in active, balanced life-styles; commitment to innovation and entrepreneurial initiative. Building on the structured core curriculum of the first year, students tailor their course of studies in the second year to their own backgrounds and career objectives. There are no required courses. Choosing from offerings in Accounting, Decision Sciences, Entrepreneurship, Finance, Management, Marketing, and Sports Business, students must take 12 electives. 3 of these may be taken outside the business school as long as they are germane to an MBA degree; these include courses in advertising, arts management, economics, education, environmental studies, law, not-for-profit management, psychology, and public administration. 2nd-year students also participate in business plan competitions, including LCB's New Venture Competition in Portland, and help organize annual events, such as the Sustainable Advantage Conference and the Women in Sports Symposium. The first-year curriculum has three major objectives: 1. Introduction to all the functional areas and analytical tools of business through the cross-fuctional core, consisting of 12 course modules: Statistics, Economic Analysis, Marketing, Financial and Managerial Accounting, Corporate Finance, Financial Instruments and Institutions, Strategy, Human Resource Management, Project & Operations Management, MIS, Business Law & Ethics. 2. Cultivation of communication, teamwork, leadership, and job-hunting skills through seminars and day-long workshops; 3. Application of newly acquired knowledge and skills through Strategic Planning Project--a 6-month, team-based consulting project on an actual business opportunity or challenge faced by a Pacific Northwest company. Want more info about University of Oregon Charles H. Lundquist College of Business Full Time MBA? Get free advice from education experts and Noodle community members.